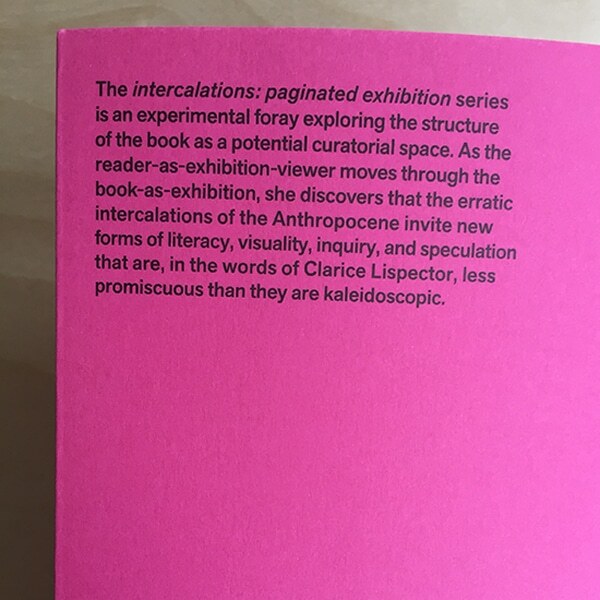 Last month Anna-Sophie Springer and Etienne Turpin visited the CRC/bookshop to talk about their intercalations: paginated exhibition book series. Springer is a Berlin-based curator, writer, and co-founder of K., an independent publishing imprint and curatorial-editorial platform. Turpin is the founding director of anexact office, a design research practice based in Jakarta, Indonesia, that works on the sociospatial articulation of knowledge infrastructure. As members of the SYNAPSE International Curators’ Network, Springer and Turpin co-edit intercalations, a series of six titles commissioned by the Haus der Kulturen der Welt as part of the Das AnthropozänProjekt. The first two titles of the series, Fantasies of the Library and Land & Animal & Nonanimal, are currently on sale at the CRC/bookshop, along with Traversals: Five Conversations on Art and Writing, also published by K.
Daisy Nam: How did you get started with intercalations? Anne-Sophie Springer: We were at the Haus der Kulturen der Welt (HKW) as part of a workshop the SYNAPSE International Curators’ Network organizes every two years. In 2013, the topic was the Anthropocene. There were eleven international curators taking part; everyone involved was very interdisciplinary and had quite versatile practices. During the workshop, Etienne and I both gave presentations about our respective publishing practices. At the end of the workshop, we both were approached by the HKW to propose a concept for a publication series. Etienne Turpin: When initially thinking about the series, we didn’t want to have all six books directly address the Anthropocene; it’s not so interesting to repeat this theme so many times. We were also trying to think about knowledge infrastructure andhow certain visual economies that exist in the Anthropocene can be re-narrated in terms of the archive, of futurity, and of agency. D: How did you arrive at the book-as-exhibition format? Were there other exhibitions on the Anthropocene that you found unsatisfying? A-S: Well, maybe not exactly in the way that you’re asking. When we were working at the HKW, the The Whole Earth exhibition was on; the show articulated a certain legacy of the Whole Earth Catalog as a kind of book laid out in a space. 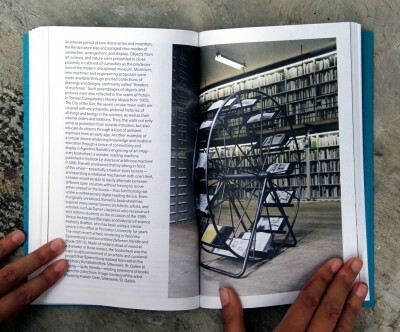 K. Verlag works from the opposite direction, maybe; we try to use the architecture of the book as a space of exhibition. It just so happened that the host institution had a major exhibition on that triggered similar questions. 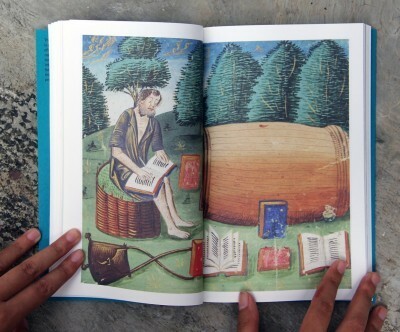 It was fortunate and serendipitous, which allowed for the concept of book-as-exhibition to become legible and present in a much stronger way than the two of us would have triggered by ourselves in the workshop. E: And K. was already working on this idea, the book-as-exhibition. A-S: Yes, from the beginning the premise of the press has been to interrogate the polymorphic relationships between artistic, curatorial, and editorial agencies—starting from the question what an exhibition catalogue does or doesn’t have to be, Charles Stankievech and I have both we have been exploring the book-as-exhibition concept for a while now. E: For us, the “exhibition” part of the intercalations series didn’t need to happen. The book was the primary site of the exhibition. The architecture of the book, especially in Fantasies of the Library, is also manipulated, which is to say designed, to introduce exhibition tropes into a readerly practice. A-S: A question that came up at K. before the series was: “How would you exhibit books that declare themselves as exhibitions?” Going back to the 1960s, artist books like the ones Michael Snow or Seth Siegelaub made, and more contemporary examples like many of the books you have here, have a certain an element of exhibition. They are books that want to be shown and presented. But if books are shown in a vitrine, as they usually are in gallery spaces, it cancels out their power. E: They become objects … . A-S: … And the reader cannot access them. So how do you put books in a space in a way that makes sense? I came back to the library as the logical space for books, where they can exercise, or actualize, what they are. As part of the exhibition Ex Libris, I made a series of displays in various libraries creating meta-spaces inside of the book and outside of the book. That’s what led me to the idea of the paginated mind, a concept referencing the mental space of the book and the physical space of the library. Reading and writing processes exchange and move through the library as a curatorial space. 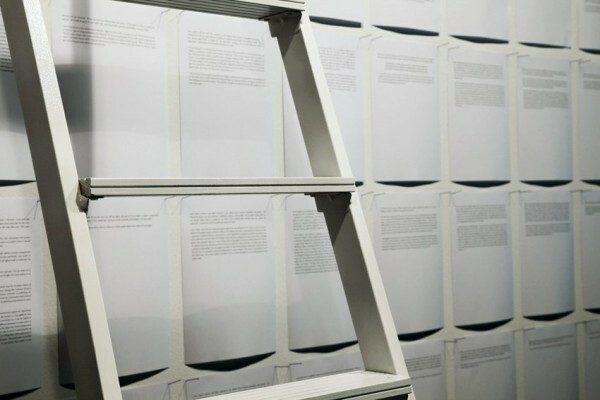 Traversals is another articulation of the book-as-exhibition that K. published in 2014. D: You also had a physical exhibition for Traversals as well? When I saw the images online, I imagined someone using the ladder and reading one interview and connecting it to another interview down on the other side. E: … and as knowledge infrastructure. A-S: Yes, as an infrastructure, or a space-time-relation that you move through. The movement through it is part of the experience; it’s not a neutral or invisible act. E: In some exhibitions, you’re forced rather didactically to physically walk from one room to the next. But in Fantasies, we wanted the reader to move through the book-as-exhibition with less confidence, with more affinity for distraction and diversion. When you read through one section, you are solicited by adjacent pages, which make you realize there are parallel texts. These adjacencies lure the reader, and help shape the book as a space of exhibition. So, we wanted to be conceptually sharp but not spatially didactic. D: What were other concepts behind the making of Fantasies of the Library? A-S: People have asked what Fantasies has to do with the Anthropocene, or with the intercalations series more generally. All the other books have to do with nature-culture tensions, or appear to have direct lines into certain core “Anthropocene questions,” whatever that means. But it is as exactly as Etienne just said: it is an intellectual exercise. So the book plays with being both a “reading room” and a “reading machine,” for example, while also reflecting on other such projects from the past and the present. It sets the scene for the rest of the series, or, as we like to say, it acts as the shelf for the other books in the intercalations library. E: There is also a design aspect to this project that’s not just conceptual. We were thinking: so, then, how do we lure someone to pick up the book and engage with it otherwise? Creating knowledge infrastructure is also a design project and is not just conceptual. Our designeris Katharina Tauer, who is based in Berlin. She was amazing to work with and made these ideas into an incredibly elegant work; she has a meticulous understanding oftypography and spacing. A-S: The six covers of the books in the series are also from this image [Orra White Hitchcock, drawing of strata near Valenciennes]. So the next books of the series follow this schematic, erratically. E: There’s no content before the form, and vice versa; they have to come together. But, at first, we were nervous about this. A-S: As Etienne said, it’s fundamentally important how you think of design as an element of the articulation. When books first arrived from the printer, I thought it was a failure. In the editorial process—for months—we had seen the book as a PDF on the computer screen. So the layout on the screen was the left and right page of the book and I would scroll down top from bottom. The physical relation of the eyes, mind, and the digital screen is a completely different from that of the codex, where you go through the pages by turning them. At first, it was so disorienting reading the book page by page that I wasn’t sure it had succeeded. E: Maybe we overthought the content, but we didn’t overthink the design format. You don’t want people to be thinking about the form too much and then lose the content in the form. We also didn’t want to be “gimmicky” with the format. There’s a habit of reading a book that is easy to anticipate. The book is for humans (although in Land & Animal & Nonanimal these questions are posed differently). So, first things first, books are for people. Books are for human readers and it’s okay to admit that humans read in a certain way, with certain expectations. A-S: It’s funny because someone actually told us that she read Fantasies twice. The first time, she managed to read the whole book contiguously, one page to the next. We were wondering how any of it made sense to her! D: In this series, there are multitudes of ideas that come together. I like how you reference Clarice Lispector in the description of the series. A-S: Yes, we love this too, because Lispector wrote, “I’m not promiscuous. I’m kaleidoscopic.”The books really come out of a network of practitioners, researchers, and academics, all of whomwear multiple hats. We’re trying to create an outlet for them and their articulations. The books are conversation pieces. They create space conceptually within the book, but also outside, beyond themselves. Even now, some copies have already left the space [during the interview, three customers bought books from the editors] and are carried on somehow in the world. The books are an excuse for continuing to think and to ask, and establish different kinds of connection to the ideas they convey. To take this space and time to consider how we act and think, how our lives are ordered by certain assumptions about knowledge and knowledge infrastructure, might seem somewhat luxurious. But,this process of reflectionhas really been about collaboration and exchange, about sharing ideas and concerns across the amusing divisions we still call “disciplines.” That’s ultimately also where its urgency lies. E: Because, you have to fight for the space and time to think, which increasingly absent from the Higher Education Industry.You only get to think in academia if you’ve filled out enough performance evaluations! Through this project we can ask some questions that academia seems to have been forced to abandon, like: “What is reading? What is thinking? What is infrastructure?” It’s about moving transversally, undermining disciplinary blockages, losing things, and forgetting the behaviors, which make contemporary academia so full of sad passions. D: I know Fantasies of the Library is out-of-print already, but when are the other books in the series coming out? E: Imminent releases! Both Reverse Hallucinations in the Archipelago and The Word for World Is Still Forest will come out at the same time, in the summer of 2016. A-S: We’re really excited because the MIT Press also approached us to re-print Fantasies of the Library in an expanded second edition. It’s great because MIT has traction here in North America. Before, I would just carry them in my suitcase and bring them to McNally Jackson or here, to this bookshop. Through the second edition, Fantasies gets another chance in the world, and hopefully it will be much easier for readers in the US to find it. For more information and updates, visit the K. website.